Add a side salad and you’ve got the prefect meal any time of day! In the mornings, I find I much prefer savory food to sweet, which is great for a keto diet. Most sweet breakfast foods contain carbs and sugars that I like to avoid. This crustless egg quiche is the answer to my problems. I love making this for brunches, weekdays, dinner, you name it! My family loves quiche, and this recipe is seriously so flavorful that nobody ever misses the crust! 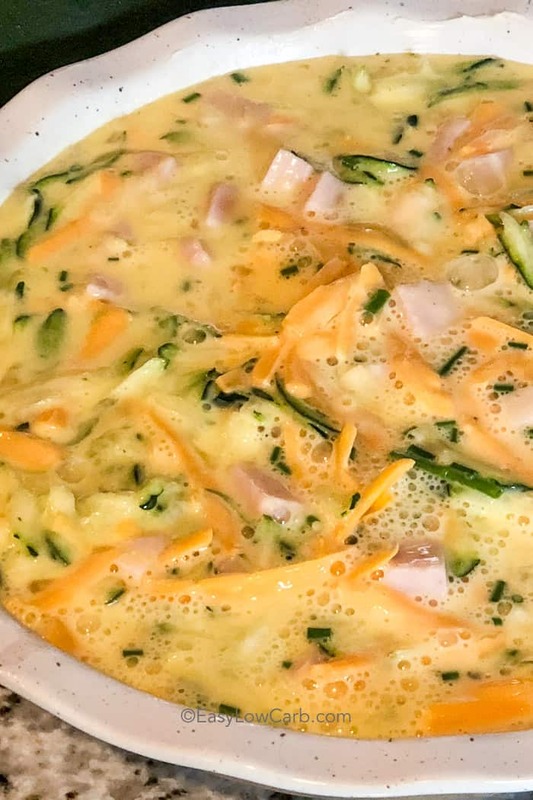 I sometimes like to add spinach to this recipe to create a crustless spinach quiche or other veggies or meats I have on hand! The addition of heavy cream to your eggs really helps to fluff them up and lighten the overall dish while adding a subtle richness that will impress everyone. Without the cream, your crustless quiche can end up very dense. No one likes a dense quiche. To make a simple crustless quiche, start by preheating your oven to 375 degrees F and greasing a pie plate. A normal pie crust contains butter which will help grease the pie plate on its own, but without the crust you don’t want to have your quiche stick to pan. Next, shred your zucchini and make sure you drain the excess water out of it very well. Zucchini adds a ton of great texture to your quiche. 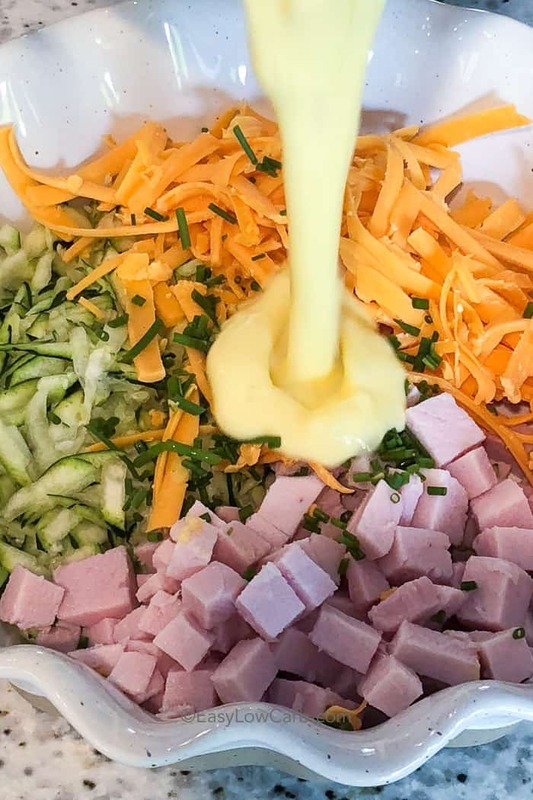 While you’re at it, get your cheddar cheese grated; keeping in mind that pre-shredded cheeses often have extra starches to keep them from clumping so grating your own cheese is best! Once your ham, cheese, and zucchini are ready, add them all to the pie plate. Whisk together your eggs, seasonings, and heavy cream, then pour this mixture over your ham mixture. Stick the crustless quiche in the oven for 40 minutes or until a knife inserted into the center of it comes out clean. If the top begins to brown before the center is fully cooked, it may mean your oven temperature runs a little hot. Just cover your crustless quiche with tin foil while it finishes cooking! A simple savory quiche perfect for breakfast, lunch or dinner! Preheat oven to 375°F. Grease a 9" pie plate. Place zucchini on a paper towel and squeeze to remove moisture. Combine ham, zucchini and cheddar cheese in a pie plate. Whisk eggs, cream and seasonings. Pour over ham mixture. Bake uncovered 40 minutes or until a knife inserted in the center comes out clean. I made muffins out of this recipe. They were awesome! Going to make the quiche pie for next get together with sister and mom. So glad you enjoyed it Elaine!! How long did you cook the muffins? So happy you love the quiche Walter! I made this last night. It was super easy to make and was delicious. Thank you for sharing. You’re welcome! So glad you loved it Karla! It is great and easy! Glad you loved it! This is caused by the egg to dairy ratio, your eggs may be a little larger. Try adding an extra splash of cream! Is it still keto if I add onion and mushrooms? Mushrooms are keto friendly. Onions are okay, but used in moderation. 1/2 cup of diced onions contains approximately 5 grams of carbs. Can you convert to an instant pot or crock pot? I haven’t tried it in the IP but I’m sure it would work. Can you use spinach instead of zucchini? This was awesome, We had for dinner. I added bacon to it. My husband really enjoyed it and he’s not doing keto. Keto is delicious! Happy to hear that your husband loved it too Natalie! Can I use half and half instead of whipping cream? Whipping cream is not at all healthy. As this intended to be low carb it calls for heavy cream. You can certainly make this with half and half however that will increase the carb count (and this will no longer be keto friendly). You’re so welcome Debbie, great idea for the quick breakfast! I’ve used spinach and red peppers it was awesome!!! So glad you loved it Bernadette! What kind of ham are you using? I’ve searched a lot of ham steaks, etc and they all seem to have sugar. I am using the ham steak with the lowest sugar I can find. You’re right, many include sugar. Enjoy Christine! Do I have to use the zucchini or can I just leave it out and add a little bit of onion. I have only tried this recipe as written, but if you do omit the zucchini let me know how it turns out! Can this be frozen to eat later in the week? This quiche can be frozen for up to 2 months. Enjoy! Let me know how you like it Betty! Trying in the morning can already taste it! 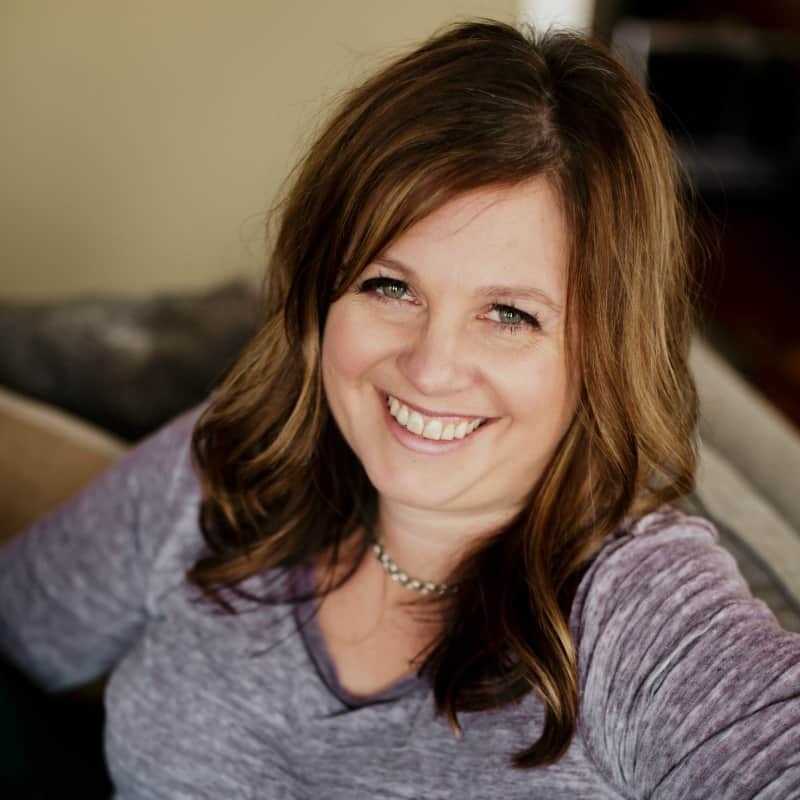 Let me know how you like it Amy! Thank you for posting this recipe. 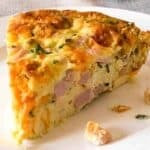 I recently pinned several quiche recipes and decided on making yours because the thought of eliminating the crust was appealing. This did not disappoint!! In addition to the ham and zucchini, I also added a couple cans of mildly spicy diced Hatch chilis. The results were amazing. It also tastes great warmed in the microwave as leftovers. This will definitely become a go-to recipe for breakfast and brunch. So glad you loved it Ken! That sounds like a great addition! I am doing keto. I don’t like zucchini, but I love yellow squash. Could I substitute the yellow for the zucchini? This recipe looks amazing. Thank you. I think that would work perfectly. I have made the crustless quiche several times for Church breakfast. I get rave reviews! So happy to hear that everyone loves the quiche Susan! I am excited to try this… it is in the oven with a few variations due to what I had in the house… I used spaghetti squash instead of zucchini and put onions peppers and mushrooms as well as a bit of cottage cheese… here’s hoping it turns out good cause it is going to a potluck in half an hour! Hope you enjoyed it Melissa! It’s always a hit for us. Can this be made the night before and bake in the morning? While I have never done that with this quiche, I think that it would work. You’ll want to take the quiche out of the fridge while your oven preheats and it may take a little longer to cook. Let us know if you try making it the day before Sue! So simple, quick, and most of all DELICIOUS. I omit the zucchini and add scallions. Thank you for sharing your recipe. You’re so welcome Gene! 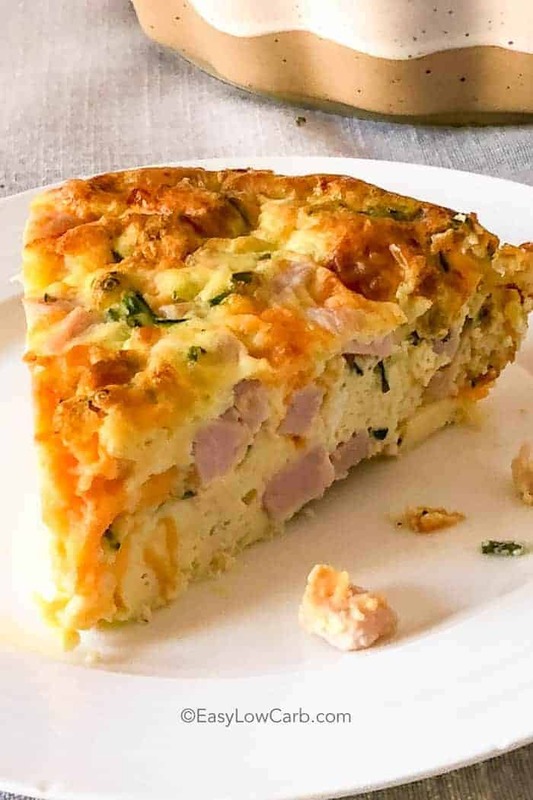 So happy to hear that you love this quiche! I’m wanting to make this in a bundt pan. Should I double the recipe or use as is? Will the cook time change for bundt pan? Thanks. I have only made the recipe as written so can’t say for sure. Let us know if you try it in a bundt pan Beth!